Our African drumming workshops are a great way to energise your team at an away day and are perfect for developing team building and communication skills including observation, sending a clear message and listening. The traditional African drumming circle relies on full concentration from all members of the group to ensure a clear, precise performance. The team building workshop begins with a body percussion warm up. This is an accessible and fun way to engage participants and dispel inhibitions, and gets them working together to develop rhythm and ensemble. 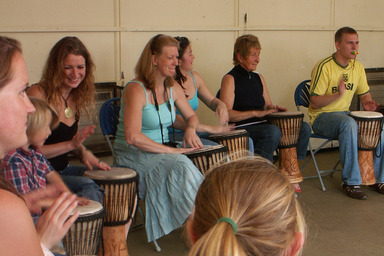 The participants are then introduced to the instruments, and experience the uplifting excitement of playing together in a drumming circle leading to a performance that can be recorded. 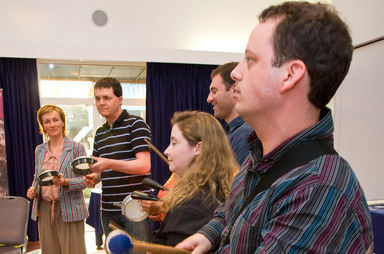 Our drumming workshops are suitable for between 15 – 50 people and are tailored to your needs - a fun ice breaker or a serious communication skills workshop. Our Latin American Percussion workshops introduce participants to the instruments and rhythms from Latin America using influences from Brazil and Cuba. Workshops can be structured as a fun, informal team building activity or can explore communication skills and performance skills. Our Samba workshops introduce participants to the instruments and rhythms from Brazil. 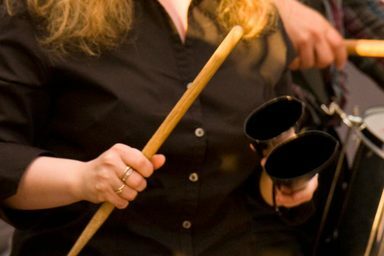 Participants can then form a Samba band using instruments such as Surdo (bass drums), Tambourim (small drums), Ganza (shakers) and Agogo bells (double cow bells). Workshops can last from 30 minutes to a whole day. Our Ceilidh (pronounced kay-lee) workshops introduce participants to the fun aspect of working as a team through traditional dances from around the UK. They are an ideal ice-breaker or an end of event activity. They promote concentration, interaction, teamwork and are fun physical exercise. Ceilidhs are accompanied by a live band and a 'caller' who leads the session. No previous experience required! Ceilidh workshops can be booked as either half day or full day workshops. Ceilidhs are also great fun for Christmas parties. 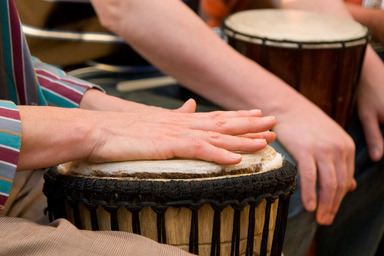 Our Body Percussion workshops introduce participants to rhythms from all over the world, creating an exciting percussive piece using only hands, feet and other body parts – as exciting as taking part in a drumming circle or Samba band. This is an ideal way to incorporate team building and communication skills into any event, whether as a stand-alone activity or as part of a larger musical experience. 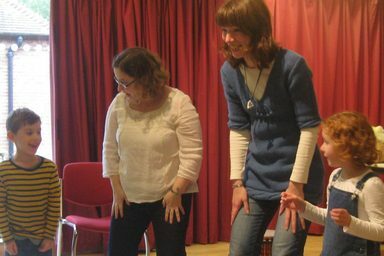 Body Percussion workshops are great as an ice breaker at conferences - particularly after the post-lunch slump! Our X Factor workshops give the participants the chance to shine like stars. 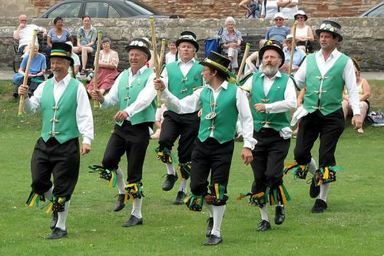 Using team building techniques, presentation skills and performance-orientated ideas, participants will have the chance to learn a song, arrange their own dance routine and perform with a live band. This could lead to either a simple concert performance of all groups, or an end-of-workshop competition between teams, adding that competitive edge to get the best results from every group. It may sound scary, but it's great fun, and addresses every aspect of presentation. 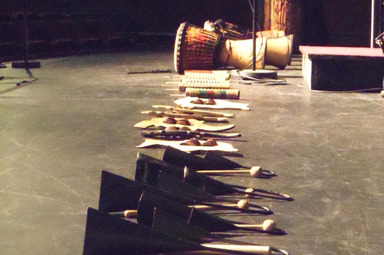 Our World Percussion workshops introduce participants to the instruments and rhythms from around the world including Djembe drums from West Africa, Darabuka drums from the Middle East, Agogo bells from Brazil and shakers from Bali. Our presentation skills workshops introduce participants to techniques used by musicians to prepare for performances and presentations. 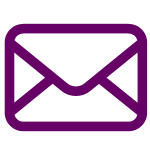 The workshops cover posture, public speaking, body language, breathing techniques, dealing with nerves and general presentation skills, providing simple but effective ways of improving all aspects of presenting. Our communication skills workshops introduce participants to a range of techniques, enhancing their communication skills, making them aware of non-verbal language and awareness of others. Communication is one of the most important aspects of business, whether working as a team or putting across new ideas to clients. Music is the ideal way of improving communication, and our workshops help all participants to work with the people around them, using sight, sound and body language to improve all aspects of communication. 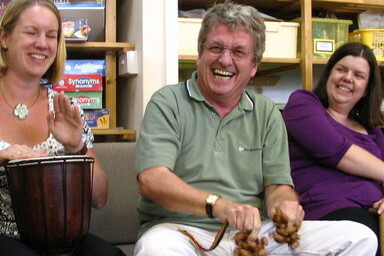 Our creative thinking workshops introduce participants to problem solving techniques through musical exploration and improvisation. These creativity techniques are practical tools for problem solving, product and service development, and creating marketing strategies. These activities free the mind from pre-conceived ideas, allowing the imagination to run free, creating new concepts in a supportive atmosphere. Our innovative approach using music to develop creative problem solving skills gives participants skills and activities that they can take back to the work place. The workshop can focus on problem solving for customers, developing new processes or new products and services. Our practical tool kit ensures your team will address problems in a more creative way using music and fun! Our team building workshops are suitable for all participants and a wide range of settings. Using body percussion and instruments from around the World, we introduce participants to the skills needed to develop successful teams such as good communication, problem solving techniques and an ability to listen and work together. Our team building workshops are tailored to your needs to focus on the skills required by your team. 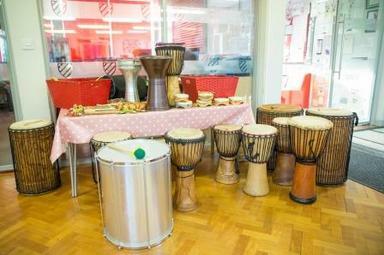 We create musical workshops for all ages, abilities and occasions. To book or if you have any questions, email us using the form below and we'll get back to you as soon as possible.